Today is Muffin Tin Monday, and the theme is Christmas. So we had a build your own snowman breakfast. Wine berry pancakes (picked and frozen last summer) with chocolate chips (for buttons), cranberry sauce (for a scarf), honey pretzels of assorted lengths (for arms), and an orange starburst (to shape as a carrot nose). Fun breakfast, huh? I posted a kid-oriented holiday giveaway yesterday (in celebration of my upcoming blogiversary) and you only need to be a follower and post a comment to enter - go check it out! I love this! Who ever said you shouldn't play with your food. ;) How fun!! Looks like we weren't the only ones building a meal. This looks and sounds wonderful. What a fun idea! I just love it! I always tag my Muffin Tin Meals as 'Play with your food!' LOL! Happy Muffin Tin Monday my dear! Get out of here! That is soooo cute! I'm going to do this for Saturday breakfast! yummy!!! 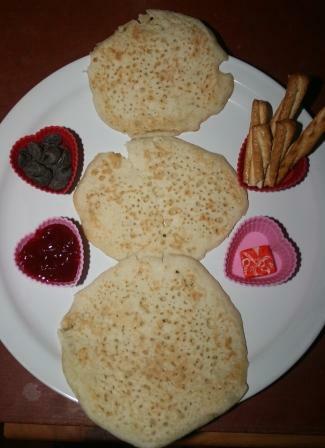 I made pancakes this morning too...I'll have to do something like this with my boys soon. A would love it! Cute idea and looks like lots of fun! Oooooo, another creative interactive meal. So cute!! Sounds yummy too. fun!!! definitely doing a version of this over here! !